Unique to other OEM modules as already has housing and is decoded with an output via standard interfaces, HID, Virtual comms and RS232.Ability to bolt onto the outside or inside of a device. Unique to other OEM modules as already has housing and is decoded with an output via standard interfaces, HID, Virtual comms and RS232. Ability to bolt onto the outside or inside of a device. Designed for OEM applications, this high performance fixed 1D scan engine can easily be integrated into various solutions such as kiosks, ticketing machines, (Reverse) Vending Machines, mobile ticket validators and many more. Compact and easy to integrate design. The small form factor enables easy integration into various solutions. The FM100 has an IP54 rating meaning it is dust -and water resistant. Includes core-technology, which is independently designed and manufactured by Newland Auto-ID. technology includes the optical, CMOS, digitizer, decoder, image processing & embedded systems. The scanner supports all global standard 1D barcode symbologies. Its' reading performance reaches and exceeds global standards. By using the accessories provided, the user can ideally set up the scanner to its user environment. 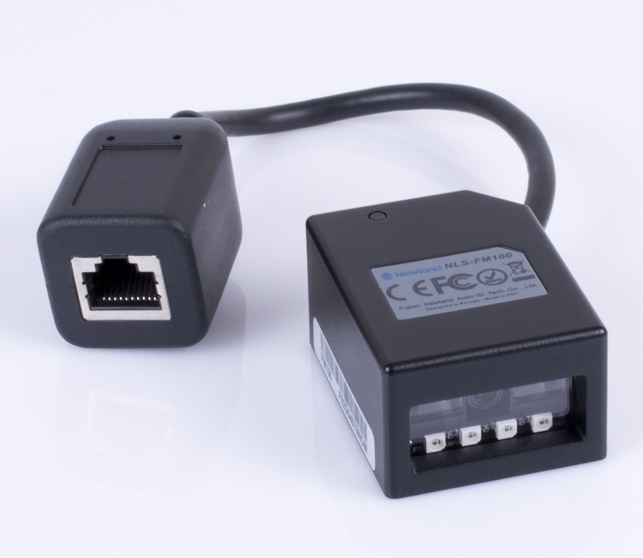 Newland FM100 Series, 1D CCD fixed mounted reader - with 2 mtr RS232 extension cable and multi plug adapter. Newland FM100 Series, 1D CCD fixed mounted reader - with 2 mtr USB extension cable. Newland FM100 Series, 1D CCD fixed mounted reader - Newland FM100 Series, 1D CCD fixed mounted reader with 50 cm direct USB cable. Newland FM100 Series, 1D CCD fixed mounted reader - with 50 cm direct USB cable and 90 degree USB connector.